The third meeting of the 2017-2018 year took place at the National Weather Service in Jackson. 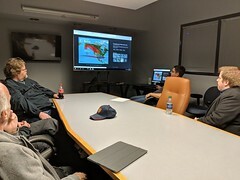 The third meeting of the 2017-2018 AMS/NWA chapter occurred on January 25, 2018 at the National Weather Service office in Flowood, MS. The meeting was called to order at 7:05pm by President Eric Carpenter. Recording Secretary Joanne Culin took a list of people present, which totaled 17 people. Minutes were summarized by Recording Secretary Joanne Culin. Treasurer David Cox gave the treasury report. The meeting began with $438.29 in the treasury. Three regular members renewed dues and one student member joined. The total at the end of the meeting was $508.29. Daniel Lamb also discussed plans for the February meeting, which will be a joint venture with the East Mississippi AMS chapter at Mississippi State University. The meeting will take place at the French Camp Observatory. Given the distance from Jackson of the meeting location, carpooling will be needed. The meeting will be on February 22, 2018 and a head count is needed to secure how much it will cost per person. 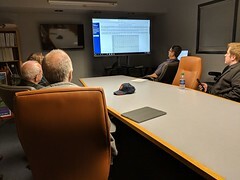 This meeting consisted of NWS Jackson Science and Operations Officer, Chad Entremont, detailing interesting things from the recent American Meteorological Society national meeting in Austin, TX. Chad mentioned that all of the talks were recorded and will be put online at some point. 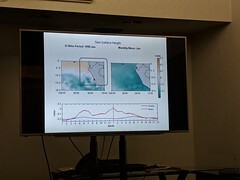 He talked about how one of the big topics was the evolution of convective allowing models and how data will increase in viewing information in order to make a forecast. He mentioned that one of the interesting talks was from the UKMet office. They mentioned about naming winter storms and that people are more aware of impacts when they can follow a storm that is named. Chad also mentioned from another talk that timing is one of the best communications done in severe weather. He noted that another talk discussed issues with WEA and how carriers differ in how the message is delivered. He noted that bigger, much more significant changes are coming with HazSimp. Discussion then turned to the procedures being developed at the Norman hazardous weather testbed, with phi. Eric showed a video explaining this to those who were not aware. The meeting concluded at 8:32 pm, and it was adjourned.